First, gain access to the classroom page for the TOLC classroom for the webinar. The link and the passkey should come to you by email from Trinity. If you do not have a link and a passkey, let us know at contact@trinitysem.edu and we’ll make sure you get a passkey. Make sure that emails from Trinity are also coming to your inbox–you may need to add trinitysem.edu to your list of accepted recipients so that you make sure Trinity emails go directly to your inbox. Please enter your first and last name (no nicknames) so that the professor knows who you are on the class roster. 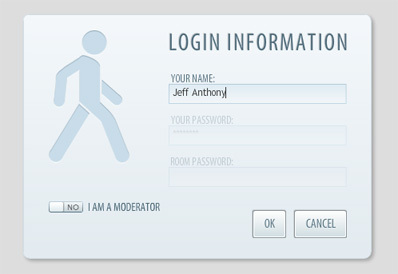 You do not need a password for the presentation, and the question “I am a moderator” should be set to “no”, which is the default. Once you are in you may use the chat to communicate with other students before class begins. It is strongly recommended that you log in 5-10 minutes before class is scheduled to begin just in case you should have any problems. If for some reason you do have a problem, send an email detailing your problem to techsupport@trinitysem.edu and it will be handled promptly. Please note that the chat is NOT monitored for tech support questions! If you have a tech problem, please make sure you let us know by email! Please note that failing the pop-up blocker test will not affect the webinar in any way, and is only relevant to the audio lecture files in the Online Learning Center. 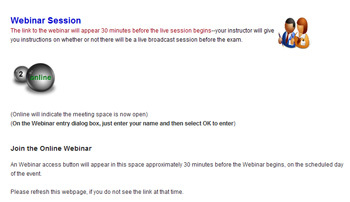 If your browser does not pass the pop-up blocker test, it will not affect the webinar in any way. While any of the major browsers (Internet Explorer, Firefox or Safari) will work with a Trinity webinar, we have found that the most trouble free browser for webinars is Google Chrome. If for any reason your browser is having issues, we recommend downloading and installing Google Chrome. It is a free download, and you can find it here: http://www.google.com/chrome. IF YOU HAVE TROUBLE CONNECTING:You will also want to make sure your router is configured to allow UDP packets. If you get a message that says the browser has tried 10 times to log in, the site is unavailable, it means your router (or public WiFi connection) is not set up to receive streaming broadcasts. You’ll need to refer to your router’s manual to find out how to change the settings to accept UDP packets in your router’s documentation, or ask your system administrator if you are on a network. You may also have problems with your installation of Adobe Acrobat reader if you have trouble connecting. Here is a PDF which will help you trouble shoot any problems you might have with your installation of Adobe Acrobat Reader. Please note: Trinity webinars use Adobe Flash, and Apple portable devices (iPhones and iPads) cannot access Flash applications. We hope you find your educational experience with Trinity’s webinar enjoyable and profitable for you. Please let us know if there is anything we can do!